"Here in a setting of wonder, dignity and perfect harmony the Motion Picture of today and tomorrow may reign supreme." The Regent was without doubt the most lavish and luxurious theatre to be erected in South Australia. It typified the opulent elegance of Hoyt's growing circuit of Regent thea tres through out Australia, and its auditorium bore a close resemblance to the Sydney Regent, which had opened just three months earlier. Adelaide's Regent opened amidst a blaze of publicity on 29 June, 1928. Described as a "Palace of Art" [The Advertiser, Adelaide, 29 June, 1928, p. 10], it contained tapestries, paintings, statuary and other objets d'art which made going to the pictures as much a cultural uplift ing experience as it was entertainment. "The theatre is a fine structure, and brought forth high praise for the enterprise of Hoyt's. In mounting the hand some marble stairway one gets an idea of its luxury and magnificence. There is a double foyer which presented a pictur esque sight with the innumerable floral tributes arranged artistical ly. Axminster carpets of blue and fawn cover the floors and the furniture is after the Louis XV period. Rucked curtains of golden-hued silk adorn the windows. On the eastern side of the foyer the walls are hung with rich tapestry, and on the western are oil paint ings. Artistic lacquer work finds place on the higher foyer, as do also exquisite marble statuettes, charm being added by the coloured illuminations. On looking in on the auditorium, one is impressed with the splendour of the pierced archway work that reaches across the huge proscenium. The sides of the building have stylised grilles of fibrous [plaster] designed on the Spanish-Moroccan style, and a system of concealed lighting is a feature, as is also the ventilation installed by George Vincent. The projection room houses two C and W biographs, and the stage has been built to carry ambitious presentations." The auditorium was designed to lead the eye towards a deep and graceful proscenium of elliptical shape, incorporat ing extensive grille-work behind which were constructed two organ chambers. These were designed to house a Wurlit zer organ of two manuals and eight ranks, identical to that in stalled in Sydney's Regent. The Sydney organ soon proved too small for its auditorium, and before the Adelaide theatre opened, the decision had already been taken to replace both organs with larger instru ments. For this reason, Opus 1728 was never in stalled in Adelaide, and was sent instead to the Regent Theatre at Perth, Western Australia, where it was enlarged to twelve ranks a few weeks after installation there. 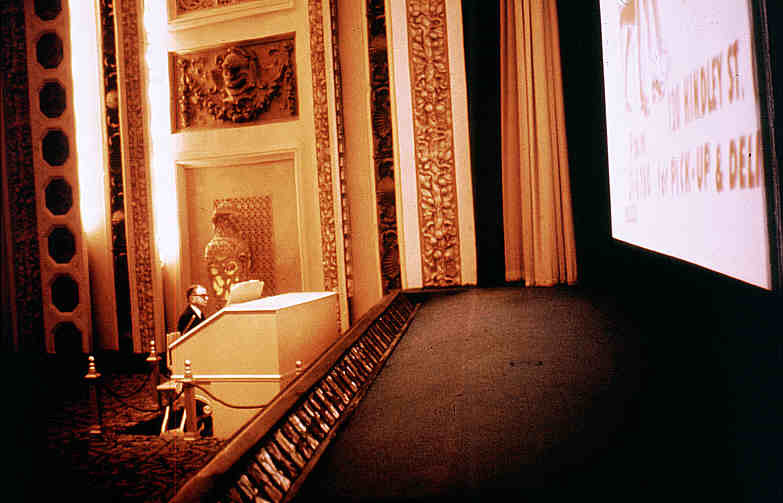 "There will be no Wurlitzer organ at the opening of the Regent. This is no change of policy, but an exemplification of the slogan of the direc torate of Hoyt's Thea tres Limited to provide only the best procurable for their patrons. A Wurlitzer organ had been ordered and arrived in Adelaide, but at the last moment it was considered that the magnitude of the theatre called for an even larger instru ment. Cables flashed to and fro, and there is now on the water a mighty instrument costing over £14,000 which will be installed in a few weeks to still further strengthen the musical side of the programme. "To compensate for the absence of the Mighty Wurlitzer now on its way, a Mustel organ has been brought from Melbourne. This will be played by Mr Leon Foulon, who came from England, where he has considerable reputation in musical circles." The Mustel organ was an elaborate reed organ of the harmonium variety. It was not suitable for solo use, except in the smallest auditoria, but was quite suitable for augmenting small instrumental combinations. "The Mustel Organ is an improved type of harmonium, invented by Victor Mustel in 1855. The in strument comprises, in addi tion to the usual harmonium stops, additional effects such as 'Harpe Eolienne', which comprises a set of two ranks of vibrators, of 2ft. pitch; these being tuned slightly sharp and flat, produce a gently vibrating effect, quite charming when used in the right place. The Mustel Organ, in the matter of novel effects, has been car ried to a high state of perfection." Other special effects included a "Metaphone", which produced a muted effect and "Prolongement", which was a form of selective sustain mechanism. Mustel organs were marketed in Australia by Chappell & Co. Ltd., of Sydney, who offered a range of these instruments with both one and two manuals [Advertisement, Everyone's, Sydney, 7 March, 1928]. All were foot-blown. "The importance of the Mustel Organ in a cinema orchestra can best be understood when its possibilities are realised. "Under competent fingers it takes the place, up to a certain point, of reed and brass instruments, making possible the effects of sustaining harmo nies. It pre serves a balance of tone, and is an excel lent back ground for violin, 'cello and other solos. It binds the various instruments into a compact whole, gives variety when used as solo, and a welcome relief from constant succession of instrumental solos, usual ly violin, cornet and flute." A week before the Regent opened, a three-manual, fifteen-rank organ was sent from Wurlitzer's factory as their Opus 1896, on 21 June, 1928. It was shipped aboard the "City of Canberra", which arrived at Port Adelaide on 30 August [Wes Johnson, "The Regent Theatre, Adelaide", The Diaphone, TOSA (NSW), Sydney, Vol.5 No. 2, April, 1967, p. 2].. Once it had been unloaded and the necessary formalities were completed, it progressed in a stately procession of six horse-drawn carts to Rundle Street in crates plastered with posters proclaiming "The £25,000 Mighty Wurlitzer for the Regent Theatre", where the cavalcade halted for photographs to be taken. It was installed by J E Dodd & Sons with almost incredible speed, for the instrument was played to an invited audience on 16 September, 1928, prior to its public unveiling on 22 September [Wes Johnson, "The Regent Theatre, Adelaide", The Diaphone, TOSA (NSW), Sydney, Vol.5 No. 2, April, 1967, p. 3]. Once the organ had been unpacked and the parts sorted, the actual installation was completed in a record eight days. During this period, the theatre's film programmes continued uninterrupted [Bill Binding, conversation with author, Adelaide, August, 1975]. Somewhere en route between the Wurlitzer factory and the theatre the console lift and the 32ft. octave of diaphone pipes vanished. To this day no trace of them has been discovered. The console was installed on the left-hand side of the stage, where it remained until a Cinema-Scope screen arrived in 1954, when it was moved to the left-hand side of the orchestra pit [Wes Johnson, "The Regent Theatre, Adelaide", The Diaphone, TOSA (NSW), Sydney, Vol.5 No. 2, April, 1967, p. 3]. Some Adelaideans claim they recall seeing the Regent console rise on a lift, but this was never the case. There was no organ console lift in Adelaide until one was installed at the Capri, Goodwood, in the 1980s. 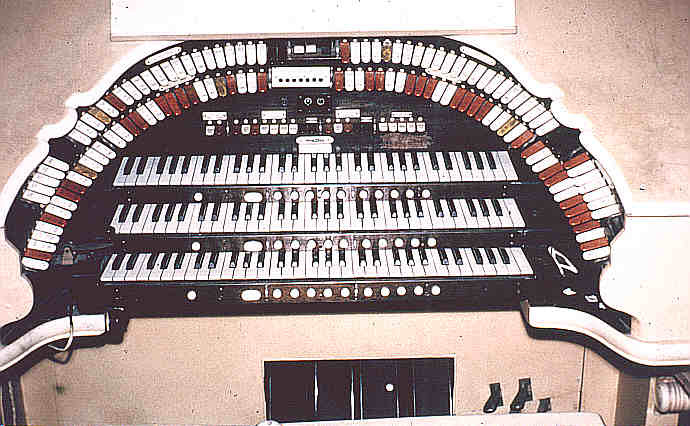 The organ's specification did not exactly match the stop keys on the console. A drum roll was wired to the 32ft. Diaphone tab, and at a very early stage (possibly even at the time of installation), the Krumet pipes were exchanged with Saxo phone pipes from the Capitol Theatre, Sydney, but the tabs were not changed. During the 1940s, a row of miniature lights was fitted below the swell pedal indica tors. These lit up in se quence as the general cres cendo pedal was depressed. Over the years, the console, which was initially of polished wood, was painted cream. The pipework was placed in two chambers on either side of, and above, the proscenium arch. The upright piano was installed on the right-hand side of the stage, but was later moved out of view below the right-hand (solo) pipe chamber. The Cathedral Chimes and Crash Cymbal were subse quently placed in an unenclosed position. In the early 1960s, the organ was overhauled, but the only parts requiring replacement were the manual ivories and the pedals [Wes Johnson, "The Regent Theatre, Adelaide", The Diaphone, TOSA (NSW), Sydney, Vol.5 No. 2, April, 1967, p. 3]. "Hoyt's have signed two new organists to supply music in their new Regent Theatres. They are Mrs and Mrs de Clemens, who are described as among the most brilliant Wurlitzer operatives in America. Mrs de Clemens is the leading woman organist in the USA. They arrive on Saturday." The duo opened the Adelaide Regent organ on 22 September, 1928. "Installed at a cost of £24,000, the new Wurlitzer organ at the Regent was heard for the first time last Saturday. With the de Clemens presiding at the console, something new in organ music was introduced, and the instrument made a great impression on an audience of over 5,000 [sic.]." Thanks to some painstaking research through the Regent Theatre scrap books and press cuttings, conducted by John Thiele, we have a complete record of organists featured at the Regent. Following Ray de Clemens, on 28 December, 1928, came fellow American Stanley Wallace, who left in March, 1929, to open the organ at the Regent, Melbourne. Stanley Wallace was followed by another American Eddie Fitch ("from Chicago") on 7 March, 1929. Next came Wallace Kotter, on 11 May, 1929, again "direct from Chicago", who gave the first broadcast on the Regent organ (on 5CL) on 5 August, 1929. All these American organists, it can be seen, were resident for only a few months each, but it was on 19 September, 1929, a year after the organ was opened, that an Australian organist was first appointed. Frank Roberts had this honour, and he remained at the Regent for just over three years. Eddie Horton, who was next at the console, from 22 October, 1932, had been playing organs in Australia and New Zealand since 1924, when he came from America to open the organ at the Prince Edward Theatre, Sydney, and could almost be regarded by now as a fixture in Australia. He was the Reg ent's last American resident organist. His time in Adelaide, though, was short, and the console was next occupied from 3 December, 1932, by Charles Tuckwell, who re mained for four years. "A young Australian, Mr Charles Tuckwell, will take charge of the Wurlitzer Organ at the Regent Theatre tomorrow. Mr Tuckwell was formerly Musical Director of Shelford Church of England Grammar School. He toured Australia with Walter Kirby and Amy Castles as pianist and accompanist, and recently has had charge of the Wurlitzer at the Capitol, State and other theatres in Melbourne." Aubrey Whelan arrived on 19 December, 1936, being followed by Clarence Black on 2 April, 1938. Desmond Tanner ap peared for a guest week from 21 April, 1939, when he accom panied a touring show featuring the harmoni ca player Larry Adler. Penn Hughes took over from Clarence Black on 19 May, 1939, staying for a year and ten months. He was absent in Sydney for a week from 21 October, 1939, during which time local organist Lloyd Vick guested at the console. Brian Richardson also played for a week, from 30 May, 1940, when Penn Hughes was absent. Owen Holland came from Sydney on 28 March, 1941, followed by Stanfield Holliday on 11 July, 1941. 30 July, 1942, saw a female organist at the console for the first time since Mrs de Clemens had played duets with her husband at the organ's opening. Irene Lapthorne was billed as a Guest Organist, but was at the Regent for some six months. After her came Tom King, a well-known musical figure in Adelaide, who had played pianos and photoplayers in theatres in the silent days, as well as appearances in restaurants and other venues. His first performance at the Regent was on 19 February, 1943. After four and a half years, his place at the console was taken by Geoff Robertson, who played from 18 July, 1947, until he left for the Regent, Melbourne, on 17 July, 1949. "Geoff made his mark in Adelaide (during a brief two years here) by fostering the music of local composers. This gener ated a lot of interest around Adelaide. Within a month of arriving at the Regent, up to 30 composers had submit ted music to Geoff (some of it already published). 120 manuscripts, on paper of all shapes and sizes, were piled high on his desk. The best of these were featured in his weekly programmes at the theatre." The final, and best known, organist was Knight Barnett. Knight Barnett was resident from 26 August, 1949, until the theatre closed in 1967. During that time he made more than 1300 radio broadcasts from the theatre [John Thiele, "A Tribute to the Regent Theatre, Adelaide", TOSA News, TOSA (SA), Adelaide, December, 1987, p.9]. Relief organists included Brian Richardson, Cliff Johns and Ian Johnson [Wes Johnson, "The Regent Theatre, Adelaide", The Diaphone, TOSA (NSW), Sydney, Vol.5 No. 2, April, 1967, p. 3]. The Regent's Wurlitzer organ had a particularly rich and sumptuous sound, which made it a favourite of many Australian theatre organ lovers. From 1963 onwards, they came from across the nation in an annual pilgrimage each Easter to enjoy its sounds at the hands of long-time resident organist Knight Barnett and many other organists. This annual event developed into TOSA's annual conventions which are hosted in turn by the various Divisions. On 30 March, 1967, the Regent theatre closed for reconstruction into a smaller theatre (incorporat ing the circle and foyers of the original theatre), and the organ was removed. It was featured on the closing night by Knight Barnett and Irene Lapthorne ["Regent Theatre, Adelaide, Closes - Organ in Storage", Vox, TOSA (Vic), Melbourne, August, 1967, p. 4] . After the closing night, the organ was carefully removed into storage under the direction of Bill Binding, who had directed its installation in 1928 and had since then been respon sible for its regular tuning and maintenance. It was over hauled, but not otherwise altered, and installed in the Memorial Hall of St Peter's College, Adelaide. This work was also carried out under the direction of Bill Binding. On 28 June, 1993, what remained of the Regent celebrated its 65th birthday. Chris McPhee was featured at a specially-installed Lowrey "Heritage" organ for four days [John Thiele, "The Regent Theatre Turns 65", TOSA News, TOSA (SA), Adelaide, August, 1993, p. 10].